TTX is a sport made for a party. 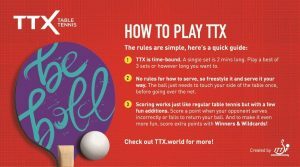 So during the festive season, why not take a look back at the first ever TTX tournament in 2017. Putting a new spin on the sport, TTX is looking to take table tennis to the streets. Fluorescent bulbs have been traded in for rays of sunshine and rubber flooring has been cast aside for sandy beaches. With tables that look like they’ve been drawn from the mind of Andy Warhol, the sport you know has had a serious paint job. 2017 saw the first official international event when a TTX festival was held in Düsseldorf. In front of the Rhine River, the mini tournament was played with 16 athletes, ranging from ITTF President Thomas Weikert, to India’s Sharath Kamal Achanta. Fittingly, glitz and glamour won out as Bernedaette “Barbie” Szocs took out the first ever TTX title. More TTX will be coming your way in 2018, so why not smash in to the unknown and see what the new sport has to offer. Check out the rules, download the app and bring TTX to your Christmas party!